(CNS): The United Democratic Party is opening a new office in the capital as its national headquarters. The new party office is situated at Rankin’s Plaza, off Eastern Avenue, and is likely to become the hub of the party’s campaign in the critical George Town fight. With six seats, 7500 plus voters and an expected long list of candidates, the capital will be where the May 2013 General Election will be won and lost. So far, the UDP have officially declared only two candidates for George Town — incumbents Ellio Solomon and former Cabinet member Mike Adam, who gave up the community affairs ministry to stick by former premier, McKeeva Bush, following the no confidence vote in December that saw him ousted from office. However, TV weatherman John Foster, who will be acting as MC at the official opening on Tuesday evening, is tipped to be running on the UDP ticket with Adam and Solomon, as well as local business Renard Moxam and waste-management consultant Walling Whittaker. Last week Bush announced that Tessa Johnson-Bodden had replaced Sherri Bodden-Cowan, who appears to have left the beleaguered party, as its chair. He also indicted that the UDP could be adapting the party name slightly and calling itself the National United Democratic Party ahead of the political fight. The UDP was split down the middle in the wake of the no confidence debate in the Legislative Assembly a few days after Bush’s arrest on suspicion of theft and other offences under the anti-corruption law in December. Despite the forced departure of his two former West Bay colleagues, Rolston Anglin and Cline Glidden, and the two Bodden Town members, Mark Scotland and Dwayne Seymour, along with the voluntary resignation of the current premier Juliana O’ Connor-Connolly, Bush has made it clear he intends to mount a full campaign in an effort to regain power. However, he remains the subject of at least three police investigations and is currently on police bail until March. It is not yet clear who will be running with Bush and Captain Eugene Ebanks in West Bay or who will take up the party fight in Bodden Town, but the former premier is expected to run a full complement of UDP candidates in the larger districts. The opening of the office is scheduled to begin at 5:30pm and all are invited to come out and join Bush, Solomon, Adam, Ebanks and party officials for the celebrations and free refreshments. Where are all the other candidates? Where arre your Headquarters? When are you going to have public meetings…Mckeeva is out there blazing the campaign trail and none of you are out of the gate yet.. Am I going to to have to vote for KEKE again as he seems to be the only one not worried abaout getting a little beat up. I bet all of you who are writing negative stuff about Mckeeva are fans of the PPM, Mckeeva getting back in power ya hear wa ah tell yuh!! We hear ya dude, we believe in reincarnation too. Sorry. You'll have to relocate to Georgetown if you want a fridge this time. You people who tear up and down without understanding the dynamics of this country's politics certainly don't have a clue. Here we are with the NUDP, PPM C4C and a host of other relatives and friends all vying to represent the people of this country. This is Democracy at its best, differing view points, and dislikes aside we are unique in that this is still our way of life. Like them, Hate them, revere them, spit on them after the election there will be an mixture of all of these groups in the House. There will be no clear majority, people are confused, alliances of the past are enemies of the futuree, wealth comes to Politics like cotton comes to Harlem, in the guise of salvation; and a Coalition Government (formed in the reminiscent ole-fashion Turtle meat style), will stand forth to govern for the next 4 years. So which group do you believe will cook the best turtle meat? And will it have fin? Or do you think Kurt's cayman style beef is better? Maybe his beef, but certainly not his turtle meat. National United Socialist Party would be more like it. Elio can be the first Propaganda Minister. Sir Vassel must be turning in his grave. My oh my what greed can do to weak character. There is a commonthread of unbridled greed and self interest running through the UDP. Show me your friends and I will know what you are made of. None of these new additions are a surprise to those who know them. Self first and throw crumbs to the little people. anyone associated with mac and foolio should be shunned by the rest of society…..
And the key thrown away. When you see McKeeva shifting from West Bay you can start believing there may be some hope for Cayman. At least he's not putting it in Caymana Bay. Yet. Bush, Folio and Santa would not get my vote. PPM is dead…….UDP is having shortness of breath and will soon expire!!!!! The party system in Cayman is DONE!!!!!! But be woefully careful of those persons who claim to be independent. I am miserably scared to vote for anyone as I know if elected and they called themselves independent that they would straddle the barb wire fence to get “in” with the majority. UDP, PPM, C4C are all alike!!!!! A bunch of self centred, self serving,, egotistical, nimiacal and self praising persons!!!!!! This election I shall be headed to Pickle Bank to pick up some fresh fish!!!!! Well final slap in the face of West Bayers now. Poor things will vote Mr Bush back into office in order to help him care for his voters in every district. Right now he is surrounded by BTers, GTers and Jacans and one or tow West Bayers and West Bay voters fell for his story re OMOV now can see, we hope, how it helps UDP and no one else. Even the independents in other districts can't convince me they're not UDP members in disguise. Think they have it figured out ………WB loyals secure, Jacans convinced, no OMOV, no real independents (YET) so it looks pretty good for UDP, guess we'll see how smart the new voters are and if Caymanians have learnt it was UDP candidates in the other districts that seal the deal to have Mac. SO are you guys doing that again? If not don't vote for ANY UDP current/former members aka indpendents. So the freeness will soon start to flow. Anyone know how I go about applying for new appliances? I need some new windows too while they at it!! Maybe it should be RUDP then? It's not national, nor united , nor democratic—perfect name! Actually it should be RUDE. Renard's United Democratic Enterprises. I think it's such a horrible thing that honest people have to vote for dishonest politicians. We are hearing a lot about about who is throwing their hat in, but we are not hearing much about what they plan to do. I guess the solution is for honest people to stand. 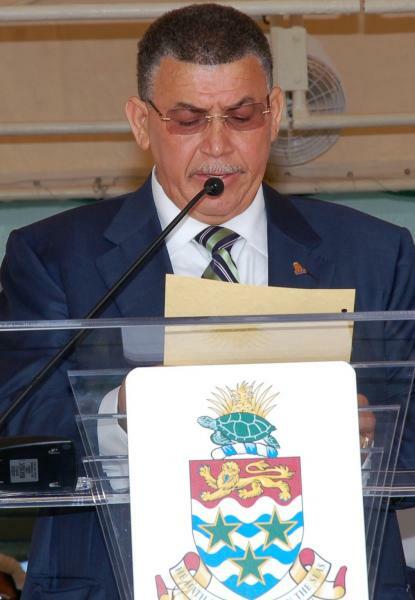 Children of the soil of Cayman, come on, where are you? You are the backbone of Cayman, you are not the corrupted business leaders, but the fathers and the mothers, the ones who kneel at their bedside every night and thank God for another day, the ones who give expecting nothing in return. As you sleep, the thieves and crooks take your birthright. If you are true and genuine and love your country, please stand or else we will end up with another bunch of "say all-do nothing." Yea, Birds of a feather flock together! Doesn't surprise anyone in GT who he is mingling with! What a waste of money setting up that new HQ. Big Mac and his Fries ain't getting back into power. You are incorrect. Did you not see that crowd of of voters that was there. Must have been the entire Cayman there. Would only take Mack to draw a crowd like that. Does this mean he can stand for GT with FIVE dummies alongside? Hope not because 6 controls the MLA even without a so called party! Actually, there cant be that many people in GT stupid enough to fall for it, better stick with West Bay! Eat them out, drink them out and VOTE them out. Yes, foolio has raised lots of funds for fresh kool aid and John Foster is predicting 96 degres in the shade in May. Watch out Cayman. Renard, in for a penny, in for a pound huh? Got too much riding on dat horse to back out now… Remember, dont bet anything you are not prepared to lose, including your name and good will. UDP has more branches than Fosters! Who is paying for them?? Should be pretty obvious who’s paying them….